NOTICE: Activation key must be used on a valid Steam account. Requires internet connection.ABOUT THE GAMEIn a desperate war for Earth’s survival, against an unrelenting enemy, the only way to defeat them is to become one of them. Armed with advanced weaponry and vehicles and aided by an elite squad of marines, you take the battle to the heart of the Strogg home planet and become earth’s only h… ope for victory.KEY FEATURES	Built on id Tech 4 (the Doom 3 engine) Sequel to the Quake 2 storyline Battle outdoors using tanks and walkers Fight with the support of an elite squad Compete online in fast action, arena-style multiplayer SYSTEM REQUIREMENTS Operating System: Windows® XP Processor: Intel® Pentium® 4 2.0 GHz or AMD® Athlon® XP 2000+ processor or higher Memory: 512MB RAM Hard Disk Space: 2.8GB of uncompressed free hard disk space (plus 400MB for Windows® swap file) Video: 100% DirectX® 9.0c compatible 64MB 3D hardware accelerated video card required Sound: 100% DirectX® 9.0c compatible 16-bit sound card and latest drivers DirectX® Version: 9.0c Quake® 4 © 2005-2011 id Software LLC, a ZeniMax Media company. 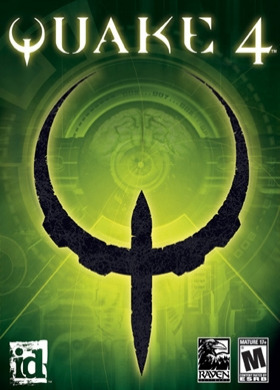 Quake, id, id Software, id Tech and related logos are registered trademarks or trademarks of id Software LLC in the U.S. and/or other countries. Bethesda, Bethesda Softworks, ZeniMax and related logos are registered trademarks or trademarks of ZeniMax Media Inc. in the U.S. and/or other countries. All Rights Reserved.